Hard Seat option fits the EZ, the EZ 2, Power EZ, Power EZ 2,and Super Power EZ Pool Lifts. Aqua Creek molded plastic seat provides a firm, yet comfortable, option to the regular EZ Pool Lift sling-style seats. 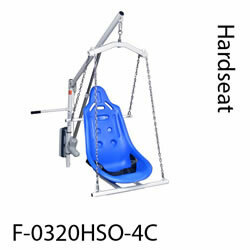 The Hard Seat option fits the EZ, EZ 2, Power EZ, Power EZ 2, and Super Power EZ Pool Lifts. 400 lb (181 kg) weight capacity.